Whether you're a history lover, into comic books, or a fan of genealogy, getting a shield tattoo is a great way to express your interests, beliefs, or heritage. These tattoos are easily personalized, as there are several different ways to make a design your own through use of color, placement, size, and the incorporation of other symbols and images. While there are potentially endless ways of designing your shield tattoo, here you'll learn the basics of the different variations and what they mean. There are a number of different variations on the shield tattoo, all of which can be personalized to reflect your own meaning and message. When deciding on a design, make sure to consult with your tattoo artist to draw up the best design for you! A classic combination of symbols, the sword and shield can reflect an individual's battle-readiness, whether mental or physical, or serve as a representation of their years in armed service. This tattoo is often placed on the bicep, indicated strength, or over the heart, a representation of one's willingness to die for a particular cause or their country. One way to personalize the sword and shield is through including the number of your regiment or the branch of the armed forces you served in: including this information on the shield thereby demonstrates that you were sworn to protect them. You can also include the years of your enlistment(s) underneath the shield or on the hilt of the sword, again lending a more personal aspect to the tattoo as well as commemorating your years of service. Another variation on this design is to include your country's crest or colors on the shield, especially if you served in your country's military. This makes it clear that you protected and fought for your country, and will also inject some color into an otherwise silver or grey-scale design. Throughout history, shields were an important tool of any soldier, and each civilization had their own unique designs and styles for their armor. One of the most famous of these civilizations was ancient Sparta. Spartan warriors were known for their ferocity in battle, and a Spartan shield tattoo is a great way to demonstrate your own strength, be it in battle or in life in general. There are a few different variations on this tattoo. 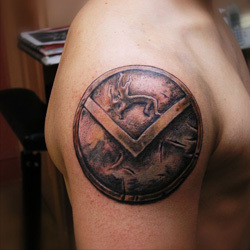 The most basic Spartan shield tattoo includes just that - the distinctive circular shield with gold and red coloring, with a Greek-style geometric design along the circumference of the shield. Included in this shield design may be a Spartan warrior himself, complete with the typical Spartan helmet: gold, covering almost the entire face, and with a red plum along the top. You may also wish to depict the Spartan warrior in battle: this can create an exciting full-back piece with as many details as you can imagine, such as various enemies - both mythical and human - a detailed setting, and even the incorporation of the Greek art style by having the design done in the typical Greek fashion, as seen on decorative pottery from the time. The possibilities are endless! 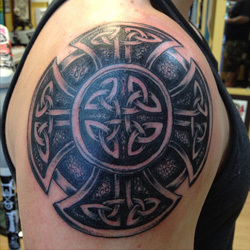 Around the world, Celtic tattoos are popular with both men and women. Getting a Celtic shield tattoo will demonstrate your ancestral heritage, inner strength, and ability to defend what you believe in. the Celtic shield should be done in a typical Celtic design: either a rounded or slightly rectangular shield shape with intricate and interlocking patterns of knots on the interior. This design can be done in grey-scale, but it will be more personal and interesting if done in color. There's no need to limit yourself to the greens and golds of the Irish flag: the use of bold reds, blues, and purples are definitely encouraged, as they are representative of boldness in battle, victory, and royalty, all very important qualities for any warrior to have! Fans of comic books and superhero movies will be well-acquainted with Superman: the man of steel, who is "faster than a speeding bullet, more powerful than a locomotive, and able to leap tall buildings in a single bound". Superman is the ultimate superhero, and getting a tattoo of the Superman shield can demonstrate your affinity for this comic book hero, your own inner strength, or simply harken back to a simpler, more innocent time in your childhood. The bold reds and blues of this tattoo make it a great choice for anyone looking for a prominent color tattoo that will stand out from the rest of the crowd. There are also a number of ways you can personalize this design to suit your own taste and meaning. Placing the Superman shield on your chest, as it's placed on the man of steel himself, can demonstrate your personal connection to this superhero, and how you may view yourself as walking in his footsteps. If you prefer a smaller design, getting the shield on your inner wrist, behind your ear, or other inconspicuous place can let it serve as a reminder of the goals you strive for and your dedication to being a good, strong person. Another variation on this design is to have the shield engulfed in flames, representing your ability to withstand the heat of any situation, or even in blood, which may indicate your willingness to sacrifice your own life for your ideals and principles. 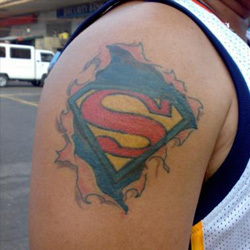 Playing with the design in this way can make it more unique than the typical Superman tattoo - just be sure to work with your tattoo artist so that he or she is completely aware of how you plan to alter the traditional Superman design. 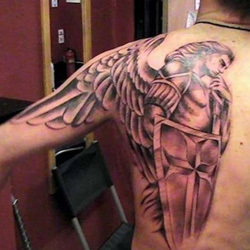 When paired with an angel, a shield tattoo can be representative of your guardian angel, watching over you night and day. While the angel can be somewhat generic, some variations on this design would be to have the angel representative of your personal guardian angel (such as St. Michael or Gabriel), or of a person you have lost but who you believe is still watching over you. On the shield, you can inscribe their name or date of birth to clearly indicate who this person is, and that they mean a great deal to you. Another variation on this design is to have the angel warding off danger or a foe of some kind. This may be something symbolic, such as a dragon or a devil, or it may be closer to your reality: perhaps a particular fear or phobia, or a representation of death, man's greatest enemy. To make any variation on this tattoo unique, play with color and scale: consider creating a full-back piece around this design, or simply place the angel on the inside of your wrist for a daily reminder that your angel is watching over you and protecting you with his shield. A shield tattoo can also be an expression of Christian faith, particularly when the shield is decorated with or depicted alongside a cross. 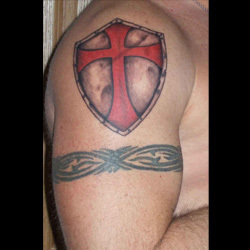 One specific variation of this tattoo is the shield of the Crusaders. These Christian warriors fought many heated battles during the middle ages, and their emblem was a red cross on a white backdrop, often included on their shield. Getting a Crusader's shield tattoo will firmly demonstrate your dedication to Christianity and your willingness to die for your faith. Another variation on this design is to have a shield alongside a cross, sometimes leaning up against the cross. This is representative of how your faith also serves as a shield: it protects you from harm and guides you along the right path. This design looks especially good on the shoulder or back, where there is ample room to do it justice, but can also be modified to fit in smaller spaces such as on the ankle or forearm. Throughout much of history, families have been known by their heraldic crests: these consisted of representations of a family's symbols and motto on a shield, often with particular colors or designs further signifying traits of the family. 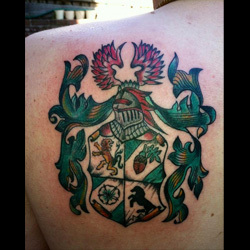 Getting a heraldic shield tattoo is a great way to incorporate your family name, history, and qualities into a design - and it doesn't get much more personal or unique than that! There are a couple different options for this tattoo variation. You could adhere to tradition - look up your family motto, historic crest, and other documented facts - or you could decide on your own crest for you and yours. This second choice is particularly great for newly married couples who want to represent their union: combine elements from both names to create a unique shield for your new family. 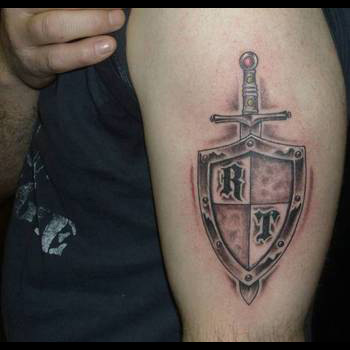 Shield tattoos are perfect for men and women of any age or creed. 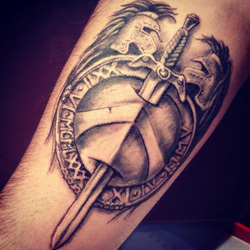 Their timeless quality, potential for personalization, and ability to project our innermost qualities and ambitions makes them a unique tattoo that you will wear with pride For custom design of a Shield, you can check our Custom Tattoo Page.